Left: Former Dallas Cowboys wide receiver Terrell Owens (Photo by Ronald Martinez/Getty Images). Right: Former TCU running back LaDainian Tomlinson (Brian Bahr/Allsport). A TCU alum and a former Dallas Cowboys wide receiver are among the 15 finalists for the 2017 class of the Pro Football Hall of Fame. The list of 26 semifinalists cut to 15 finalists Tuesday includes running back LaDainian Tomlinson and wide receiver Terrell Owens. 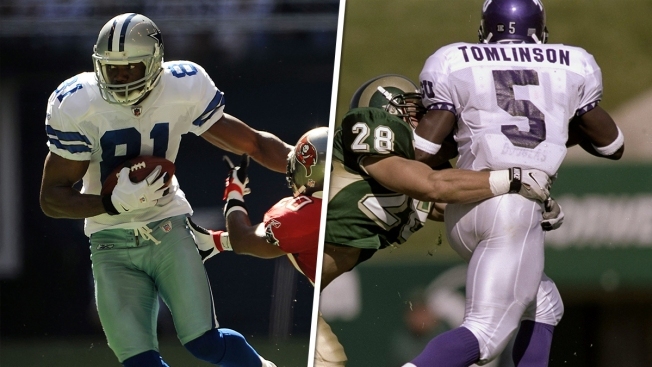 Tomlinson rushed for 5,387 and scored 56 TDs in four years at TCU and finished fourth in the voting for the 2000 Heisman Trophy. Tomlinson then went on to rush for 13,684 yards (5th all time) and 145 TDs (2nd all time) in 11 seasons with the San Diego Chargers and New York Jets. His 28 rushing TDs in 2006 is still an NFL record. He added 4,772 receiving yards, 17 TDs and even completed 8 passes for 143 yards and 7 TDs. Owens started his career with the San Francisco 49ers and Philadelphia Eagles before joining the Cowboys from 2006 to 2008. In his 15 NFL seasons, he caught 1,078 passes (8th all time) for 15,934 yards (2nd all time) and 153 TDs (3rd all time). Former Cowboys safety Darren Woodson coach Jimmy Johnson did not advance to the lists of finalists. The 15 modern-era finalists join three other finalists to comprise 18 finalists under consideration for the Class of 2017. Cowboys owner Jerry Jones and former NFL Commissioner Paul Tagliabue were named contributor finalists and former Seahawks safety Kenny Easley was announced as a senior finalist. The class of 2017 will be elected Feb. 4, the day before Super Bowl LI in Houston. Inductions will be Aug. 5 in Canton, Ohio.